All that we need is a pocket size scanning electronic microscope. It would be plenty interesting to be able to reveal all the details of crossed plates in these samples. The temperature here is the worst possible (below water saturation conditions) but still there is a rather nice display. This one has also helic arc, it came was visible in usmed image. 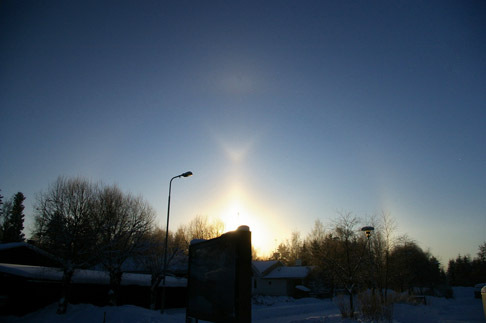 No usm in the above image, however, because it would have brightened the parhelion disproportionately because of the tree wigs.